I have for you one more summer pie. Most of the time I bake with apples, meanwhile raspberries I use just from time to time. Maybe it's because I never resist a bowl of fresh raspberries and I eat them in a few minutes. 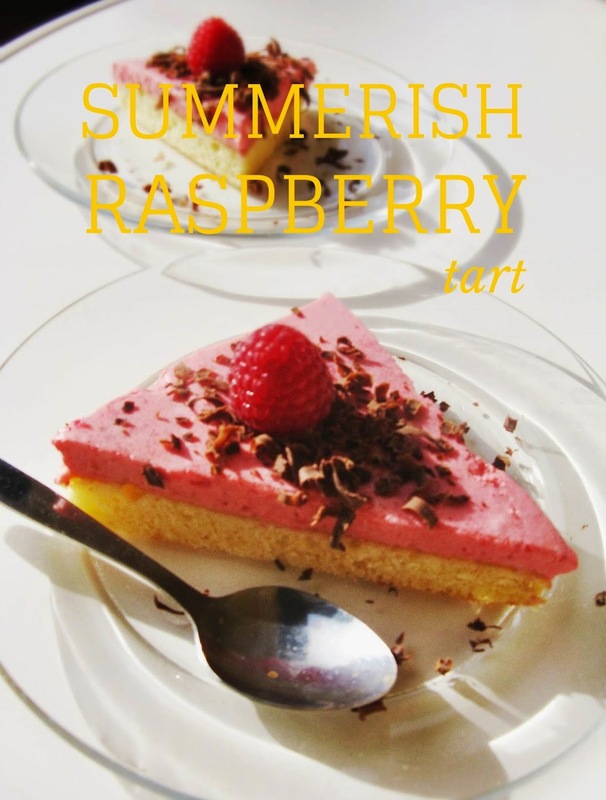 The ideal combination are raspberries with cream cheese (Czech curd). It is enough to use just classic sponge cake and you have prepared raspberry tart in a while. You can use any fruit you wish, this cake is also excellent with strawberries or blueberries. If you can, enjoy all these berries because winter is just around the corner and basically the only fruit will be apples. First, separate the whites from the yolks. Whip the egg whites until nice and thick white snow. You can add a few tablespoons of sugar. In a second bowl, whisk together the egg yolks, flour and sugar. Finally, gently stir in the snow. Put the dough into the cake tin and bake for about 20 minutes. Meanwhile, prepare the cream. Mash raspberries, just put away a few for decor. Whip the cream and then add the curd or cream cheese, sugar and raspberries. Let it chill in the refrigerator. And finally, let the cake to cool down and decorate it with cream, raspberries and grated chocolate.